I am trying to help my neighbor with his a/c. The clutch was not coming on due to low pressure switch. I jumped the switch and the clutch engaged. I charged the unit to the proper low side and high readings and everything was working great I told him we will see how fast it leaks out to see if it is a major leak or minor leak. Well it lasted about a week. Are there any known problems with this particular year and model a/c systems that I should look at first to try to make it easy. If not I will start at point a and make my way around the system. Thanks for the time. The compressor's are a well known source for leaks and is where probably most of the leaks on this system come from. Look at the compressor and if it's very oily and dirty around the body of it, especially along the bottom, this is probably where the leak is from. Also look at the low and high side charging ports on the line on top of the compressor. These can leak, especially if the caps don't have a good seal on them. The caps are the major seal for those ports. Also look at the low pressure cycling switch located on the accumulator. These also can leak. 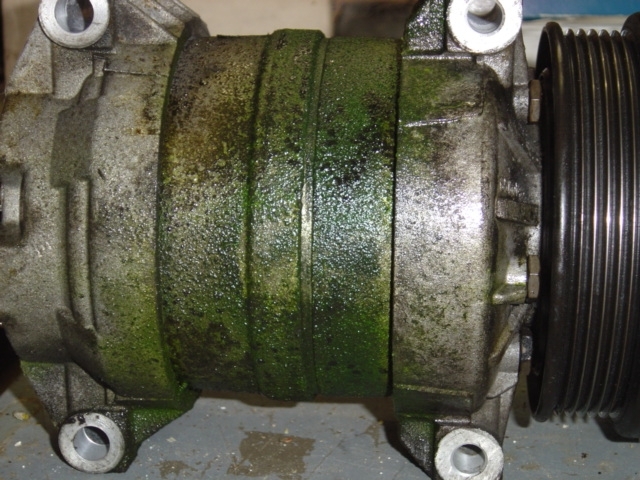 If it is the compressor, I would recommend the Seltec/Valeo or Sandan replacements found on this website. I bought both of my Seltec's here for both of my 98 chevy trucks which use the same compressor as the 97 you are working on. One of mine has been on for four years and the other for a year with no problems. Thanks for the info. The guy is a neighbor of mine and they are really hurting financially right now so I am trying to help him out. I knew about the LPCO leaking as the same problem was on my son's 89 Camaro. I will check the items you have listed. I really didn't look at it that hard when I put the freon in as he and I were hoping it would be a very slow leak. Reading on here I see a lot of post about relacing hoses that have mufflers on them. He does have those on his system if he wants to find and fix the leak should those hoses with mufflers be replaced as well. As always thanks for the knowledge! They only need to be replaced if your compressor had a catastrophic failure like locking up or that the hoses are actually leaking. If they leak, they usually leak where the rubber hose meets the aluminum. The lines with mufflers should not be flushed so if your system requires flushing because of a compressor failure, then they need to be replaced. I replaced the lines with mufflers on both of my trucks and I believe they only cost a little over $100 each. I replaced the lines on the one truck just for the piece of mind and because one point looked a little oily. The OT on the second truck looked awful so I replaced anything that had to be flushed except for the evaporator which I did flush. Looking at the orifice tube is a good way to determine the condition of your AC system. It is located in the condensor outlet tube which is located behind the passenger side parking light. Did you guys look at it? Are these things still using an R-4 compressor? Those were intentionally designed to give everyone problems with those huge front and rear O-rings depending on a tin tube to prevent leakage. Ever find stone chip protection for the condenser? I didn't, but maybe not looking hard enough. Then those R-134a service ports, a very bad joke on the consumer. Can just hear my electronic leak detector howling like crazy with a system that leaks down in a weak, have to wear ear protection. Last vehicle about that age I looked at, road salt ate away the high side coupler. But I think on this vehicle, the compressor is sitting high off the ground. Not dragging on it like this vehicle was. Then I look at the rest of the vehicle to decide if its worth putting money into, this one sure wasn't, was undrivable with major unibody rust problems just five months later. Wasn't bad 50 years ago, could buy all the parts to build a car cheaper than the retail value, they figured you were doing all the labor yourself. Today one stinking little part cost twice as much as what the vehicle is worth. High cost of fuel, replacement parts, zero tax deductions to drive to and from work, everyone I know is too poor. But only the big corporations get help from the government.